We awoke this morning to an ice-covered world, which turned out to be perfect for this week’s challenge on Cee’s Photography: Water. More birds than usual have visited the feeders today, including dozens of Dark-Eyed Juncos and Sparrows. 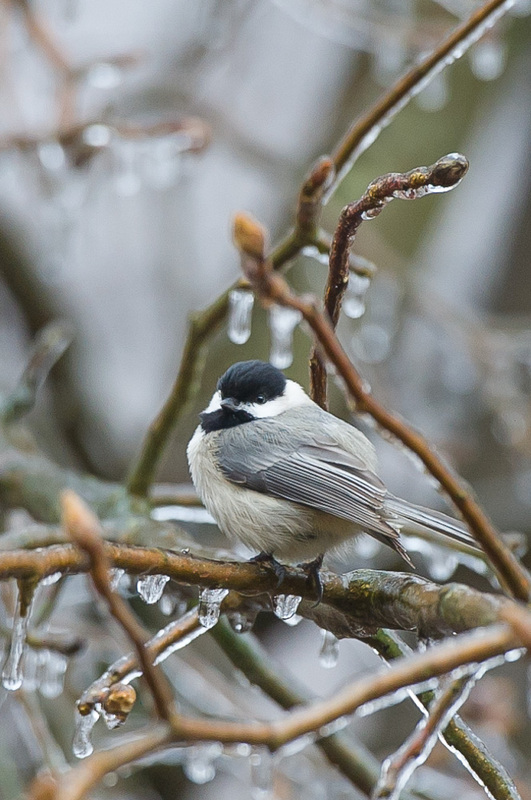 My favorite Chickadee took a break from feeding on the bell (we’re now on the third version) to pose for me on a nearby tree, puffing up to keep warm on this frigid day. The birds are definitely getting more comfortable with my camera, so I have a feeling I may even be able to get some close-up images whenever the sun comes out again.